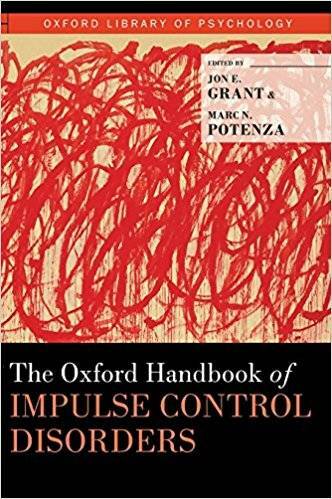 Jon E. Grant, Marc N. Potenza, "The Oxford Handbook of Impulse Control Disorders"
Impulsivity, to varying degrees, is what underlies human behavior and decision-making processes. As such, a thorough examination of impulsivity allows us to better understand modes of normal behavior and action as well as a range of related psychopathological disorders, including kleptomania, pyromania, trichotillomania, intermittent explosive disorder, and pathological gambling – disorders grouped under the term "impulse control disorders" (ISDs). Recent efforts in the areas of cognitive psychology, neurobiology, and genetics have provided a greater understanding of these behaviors and given way to improved treatment options. 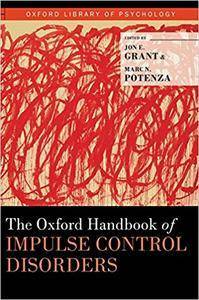 The Oxford Handbook of Impulse Control Disorders provides researchers and clinicians with a clear understanding of the developmental, biological, and phenomenological features of a range of ICDs, as well as detailed approaches to their assessment and treatment . Bringing together founding ICD researchers and leading experts from psychology and psychiatry, this volume reviews the biological underpinnings of impulsivity and the conceptual challenges facing clinicians as they treat individuals with ICDs. It is an authoritative resource for clinical professionals, researchers, and students who work in this expanding area.